With all of the tour hubbub going on in the fall, sometimes it’s nice to kill two birds with one stone. This particular concert merged the current Sonata Arctica and Dark Tranquillity tours, both great packages on their own, into one festival-esque billing. An early start (5PM), particularly for a Tuesday (and Election Day no less), with seven national acts in the billing meant that it was going to be a memorable one for certain. Unfortunately, the only sounds of Starkill I was able to witness were through the wall during an interview with Dark Tranquillity, but with any luck the band will be back around sooner than later (see Starkill interview here). With interviewing out of the way, the first band I was able to catch was that of Enforcer, who brought plenty of energy to the unfortunately small turn out at that point in the evening. Fun, classic metal riffage alongside plenty of movement and crowd interaction (including a little sing-a-long at one point) made their short set one to remember and included “From Beyond” and “Take Me Out of This Nightmare,” among a few more. Next up was Omnium Gatherum, whom I’ve managed to miss a few times at this point. They played an impressive set, expectedly focusing on newer material given the set time. A good thing though, as their last two albums have been exceptional releases. “The Pit,” “New Dynamic,” and “Skyline” all made a noticeable impression, with the band pouring everything that had into it with genuine class – vocalist Jukka Pelkonen himself giving off an infectious smile throughout as well as flashing the OG symbol (a clever use of sideways metal horns) while the rest of the band played their melodeath faire to a tee with a bounty of flair. Would love to catch a longer set from these guys! Going back more than ten years to the last time that I caught Leaves’ Eyes, the biggest thing that was kept in the memory bank was how much fun they were live. This is the first North American tour with new female vocalist Elina Siirala, and she more than proved her worth with some stunning vocal work and enigmatic presence over the set. Growler Alex Krull is a true worker on the stage, almost constantly going around to get the audience involved – and it works like a charm. Their epic symphonic metal is simply a joy when hearing it live – it’s hard not to smile (and headbang along). Much of the all-too-short set consisted of the new Fires in the North EP, but a few older tracks mixed in (such as “My Destiny”) left a lasting impression as well. With any luck, perhaps we’ll see a true headlining run in the future. In sheer contrast to Leaves’ Eyes, Swallow the Sun brought total doom and darkness to the stage. Thick, hypnotic riffs filled the air as they played “10 Silver Bullets.” A killer start, which lead to other tracks like “Hate, Lead the Way!” and “Cathedral Walls” rounding out a number of different faces to the act. 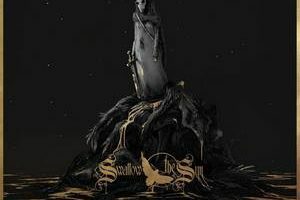 Swallow the Sun sounds even more dense live on stage than on disc, and the near-hypnotic riffs and Katatonia-esque melodies captured the crowd from the beginning. There was a definite change in atmosphere from the preceding bands, but Swallow the Sun capture their own essence, which is equally enthralling. Despite the double-billing night, Dark Tranquillity still had about a 70-minute set to engage the crowd. Much of this focus was directed at the recently released (and excellent) Atoma, with “Force of Hand,” “Forward Momentum,” “Atoma,” “Neutrality,” and “The Pitiless” all getting a chance to shine (particularly “Atoma” – wow). But the band also had some wise choices from their lengthy past, though the oldest track was the sing-a-long friendly “Therein,” but was an absolute highlight of their set. Additionally, “The Treason Wall,” “Monochromatic Stains,” “The Wonders at Your Feet,” “Final Resistance,” and “The Lesser Faith” provided a nice mix of cuts from the last 15-ish years, among a few more. Strange to see Dark Tranquillity without Niklas Sundin (who is sitting this tour out) or Martin Henriksson (who resigned to more of a band management position), but the band more than held their own. Frontman Mikael Stanne’s frequent smiles (admittedly lots of smiles for a metal show tonight – not a bad thing in the least) and energetic interactions, alongside the remainder of the band made for an infectious feeling. The crowd by this point still being only about 150-ish people (again, Tuesday night and Election Day coming into play presumably), Dark Tranquillity gave it 110% and played like they were in front of ten times that number. 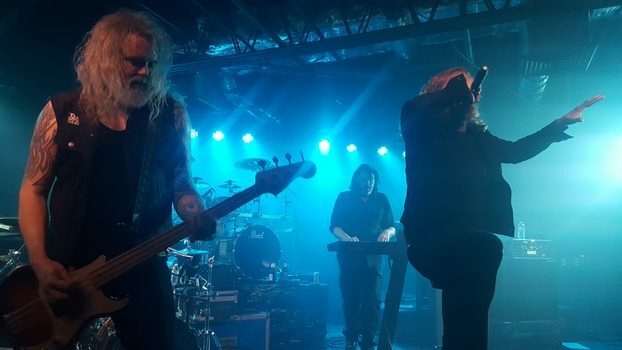 Over 25 years in the bag and Dark Tranquillity is as impressive as they have been – continuing to show themselves to be the masters of melodeath that they are. Not being huge into Sonata Arctica and fully aware of the 2.5 hour drive that awaited me (along with getting up early in the morning), I stayed only for a few songs into their set before making my way south once more. It was a different sort of feeling to their set, but the fans were enjoying it quite a bit, with vocalist Tommy Kakko incorporating the crowd from the beginning, with some group singing (complete with the lights aiming into the crowd). Surprisingly (or not so much, given upstate’s penchant for death metal above all), a number of people from the small crowd left after Dark Tranquillity’s set, but those who remained seemed quite happy with what Sonata was bringing forth. Unfortunate for such a low draw for what could have easily been labeled as a European metal mini-festival (plus Starkill), but with the mid-week and election day worries, the crowd present witnessed some excellent metal from beginning to end, and both tours are of the can’t miss mentality in this crowded late fall season.